When it comes to choosing a perfect travel bag for your little ones, it is worth taking into consideration its quality and design. It’s not a surprise that all kids like cute bright things and their luggage should not be an exception. Disney themed luggage takes the central place on the market today. 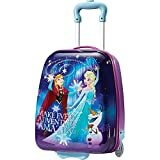 A great variety of suitcases featuring the most popular Disney characters will impress both children and their parents. Forget about long and boring trips and travel with a little bit of Disney Magic. If it seems a bit difficult for you to choose a perfect Disney cabin suitcase for your kids, we are ready to help you with this task. Meet our Top 10 Disney Cabin Luggage and make the right choice! 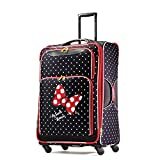 If you are looking for a quality and well-designed suitcase, Disney Minnie Mouse soft-sided spinner will be a good choice. It is made of a durable polyester material that will provide safe storage of your things during any trip. The luggage comes with single spinner wheels so it’s extremely easy to roll even by the youngest travelers. American Tourister branded locking pull-handle is specially designed for the little ones and will be comfortable for the kids of any height. The suitcase has a large main compartment as well as a mesh pocket on the interior panel for better packing organization. The cross garment straps with fun printed lining will allow keeping all the goods in the right place. Two zippered external pockets will be extremely useful for some stuff that should be within quick reach. Huge Disney lovers will really appreciate an adorable design featuring Minnie Mouse Red Bow. Be sure your kids will be so excited about their upcoming trips if they have such a reliable and cute Disney cabin luggage. Big Mickey Mouse fans will definitely like this amazing suitcase from American Tourister. It is made of durable and lightweight ABS plastic which is resistant to damages. Single spinner wheels, as well as push-button locking pull-handle, will provide smooth maneuverability. The suitcase is roomy enough to keep all things of your child for a weekend trip or sleepovers at Granny’s. Internal zippered pockets on the interior panel as well as garment straps will help to keep all goods safe during any trip. A great benefit is that the luggage is expandable so you can carry even more things in case of the long-lasting journey. Nevertheless, this suitcase is still compact enough and has a standard carry-on size for airplanes. The unique Mickey design will become the envy of many people around! If you are looking for well-crafted and appealing trolley case, that’s what you really need. This Disney cabin luggage will become a perfect option for both boys and girls who are always on the go. Looking for a cute luggage for your kids? Pack more fun in this co-branded Disney and American Tourister suitcase! It is made of a quality polyester material which makes the luggage really lightweight even for toddlers. Side mounted skate wheels together with a pull-handle provide easy maneuverability. The luggage is spacious enough to pack all the things that your children might need during a trip. You will definitely appreciate a large mesh pocket on the interior panel as well as reliable garment straps. There is also an external zippered pocket that will be perfect for some small things. The suitcase measures 18 inches in height, 12 inches in length, and 7 1/2 inches in width, so it will be a perfect carry-on no matter what kind of airlines you choose. 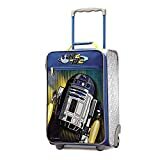 The design on the front of the trolley case is made of shiny plastic featuring popular Star Wars characters. This luggage will be definitely to the taste of boys who want to travel with fun and comfort. This cute hard-sided luggage will become a reliable companion for your child during a trip. Boys who are always on the go will definitely like the bright design featuring Disney Cars. The suitcase is made of a durable and lightweight material that will provide safe storage of your goods during the traveling. Side-mounted skate wheels, as well as easy dual-tube pull-handle, provide easy mobility. A top grab handle will be useful for parents to carry the travel bag in case the little ones are tired. Be sure, even the smallest travelers will manage to roll the trolley without anyone’s help. A large mesh pocket on the interior panel as well as garment straps will help to hold clothing in place. What is more, a zip around divider creates two separate packing compartments for better internal organization. This amazing Disney cabin luggage made by American Tourister will make any journey full of fun and pleasure. If you need a perfect Disney cabin suitcase for your kids, this American Tourister hard-sided trolley case will be a perfect option. The luggage is made of quality ABS material that is extremely lightweight and resistant to damages. It will provide a safe storage for your goods wherever you go. Side-mounted skate wheels, as well as pull-handle, will make it easy to roll even by the smallest travelers. The suitcase will be perfect for short weekend trips and overnights at Granny’s. An internal zippered pocket and reliable garment straps will provide perfect packing organization. The compact size of the luggage allows using it as a carry-on when traveling by plane. All suitcases from American Tourister have both perfect quality and appealing design. This travel case, featuring Anna and Elsa will be to the taste of any girl. It is so easy to make even the longest journey full of fun and comfort with such a reliable companion. Be sure, this Disney cabin luggage is really worth your attention and money! Looking for a cute suitcase for your little lady? 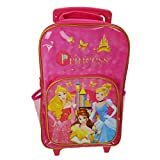 Disney Princess premium wheeled trolley bag will be definitely to your taste. The luggage has an appealing design featuring Aurora, Cinderella, and Belle characters. It is made of durable and lightweight material which is so easy to clean. The suitcase has one main zippered compartment as well as an additional external zippered pocket for smaller items. Two side mesh pockets will be extremely useful for some snacks and drinks. An adjustable handle and smooth-moving wheels provide easy mobility. There is also a top grab handle for quick lifting. The parents may also use it to carry the bag when their little ones are tired. This Disney cabin suitcase is roomy enough to keep all important things of your child for a short weekend trip and overnights at Granny’s. It will also be perfect for everyday use. Let your kids feel more like adults with their own travel bag. The compact size of the luggage makes it suitable even for toddlers. This awesome Disney Mickey Mouse carry-on duffel bag is officially licensed and made with the most beautiful printing on the front that will definitely call everybody’s attention. It is a perfect option for everyday use or weekends at Granny’s. Your little one will be happy to have his own luggage and feel more like mom and dad. The compact design allows using the bag as a carry-on when traveling by plane. 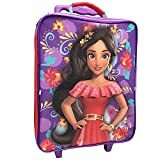 This Disney cabin suitcase is made of an easy to clean and very durable polyester material that will provide safe storage of the things during any trip. The double webbing handle and adjustable removable shoulder strap is perfect for multiple carrying options. The main compartment with zippered closure is roomy enough to pack all goods that might be useful for little travelers during the journey. Two side mesh pockets will be useful for some snacks and drinks.A cute design featuring gorgeous Mickey Mouse and his friends will be to the taste of both boys and girls. Even the longest journey will be full of fun and comfort with such a reliable travel bag! Let your little ones travel in style with Disney cars 3 Lightning McQueen molded rolling luggage! This suitcase is made of lightweight and durable polyvinyl chloride that is easy to clean. The interior is fully lined and the exterior is detailed with colorful graphics of your favorite Disney character. This trolley case that comes in a form of a racing car will be definitely to the taste of boys who are always on the go. The main zippered compartment is spacious enough to pack all important goods of your children wherever they go. External zippered pockets will be useful for some small things that should be within quick reach. Two smooth-moving wheels, as well as adjustable pull-handle, will provide easy rolling. The compact size of this Disney cabin suitcase allows taking it into the plane. Be sure, your little ones will be busy during the long and boring flight with such a reliable travel companion. The trolley is perfect for short trips and everyday use as well. What is more, a bright design will definitely call the attention of everyone around. This Elena luggage set is a perfect option at an affordable price. A cute trolley case comes with a luggage tag and a utility case to store your accessories or tablet. All three pieces of the set have a matching design and will be useful during any trip. The suitcase is made of a durable polyester material that will provide safe storage of your goods. A great benefit is that it is really easy to clean. Two side-mounted skate wheels, as well as adjustable pull handle, make it extremely easy to roll even by toddlers. Your little ones will be happy to have their own travel bag and pack all important things for their next journey. The compact size of the Disney cabin suitcase makes it perfect for short weekend trips and everyday use as well. An appealing design featuring Elena on the exterior panel will be definitely to the taste of young ladies. 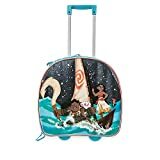 Get ready for your next journey in the company of Moana, Maui, Pua, and Heihei with an amazing Disney Moana rolling luggage. The suitcase has a compact size and will be perfect for short weekend trips and everyday use as well. Its height is 18 inches to the top of the handle, while the bag itself is approximately 14 inches tall. Well-moving wheels and adjustable pull handle provide great mobility. The suitcase is easy to roll even by toddlers. Light-up effects on the exterior panel make the luggage unique and adorable. On/off remote switch and battery pack have a compartment inside the cover. Your kids will definitely like their personal travel bag and feel more like adults. Make your trips full of fun and comfort with such a reliable companion. What is more, the light-up stars on the case will call the attention of everybody around! For many parents, it seems a great task to choose a perfect cabin suitcase for their kids. 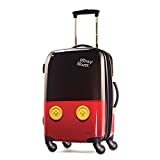 The most important criterion for little ones is the unique design of the luggage featuring the most popular Disney characters. Boys and girls are absolutely different, so there is no doubt that they will like different images on their travel bags. Among a great variety of cartoon characters, choose the one that will be real to the taste of your boys and girls. Give your children the opportunity to take a trip with their favorite Disney friends and make the traveling full of fun and adventures! Do you know what the favorite Disney character of your child is? We hope that our article will be useful for you and you will find the perfect Disney cabin luggage for your little ones. If you have already bought an amazing suitcase, write your personal review or leave a comment below. Let’s discover the wonderful Disney World together!